Follow these instructions to make beautiful 3-dimensional Russian style leaves using a variation of peyote stitch. This is one of two different style Russian Leave tutorials available. The second tutorial is for lacy Russian leaves and uses St. Petersburg stitch. This style of Russian leaf is made using diagonal peyote stitch. You will find it easier to learn this if you are already familiar with flat even count peyote stitch. Diagonal peyote stitch uses an increase on one end of the row and a decrease on the other end of the row to form an angled length of beadwork. By starting in the middle and working outward, you can use the diagonal peyote to make a V shape that you will then connect together at the center. Some other options are to use size 10 or size 11 devices for the body of the leaf and size 11 round beads for the details. If you use delicate beads for the body of the leave (A), the beads will stack neatly and seem to snap into place. Your leaves will be slightly more organic looking if you use round beads. Prepare a comfortable length of beading thread and add a stop bead to the center of the thread. You will be working on one side of the leaf and then switching your needle to the other side of the thread to make the second side of the leaf. A picot is a type of decorative edge. Skip the last three you beads picked up (A, B, A) and pass through the next A bead. Pull your thread tight and the beads will form a small loop. Working in flat peyote stitch, continue stitching down the rest of the row until you have added a total of six beads to the row. For the sixth bead that you add to the row, stitch through the first size 15 bead (B) in the previous row. You can loosen or remove the stop bead. Stitch the fourth row working in flat peyote, adding six more sizes 11 beads. After adding the sixth size 11 bead, pick up a size 15 (B) and a size 11 bead (A). Stitch through the last size 11 (A) you added in the fourth row and pull snugly. You have formed another picot at the end of the stitch. This stitch has the effect of decreasing the number of columns of beads at the bottom so it is called a decrease stitch. It is easy to remember that you are making a decreasing stitch in this project when you add two beads at the end of the row to form the picot decorative edge. Continue stitching the fifth row until it has a total of six sizes 11 beads (A). Then you will add a peyote increase at the end of the row. To make the increase, after adding the sixth size 11 (A) bead, pick up one size 11, one size 15 and one more size 11 (A, B, A). Stitch back through the first size 11 (A) you picked up and pull snugly against the beadwork so that the size 15 (B) and size 11 (A) beads you just added line up next to each other. Twist it so the size 15 bead is away from the working edge and the size 11 bead is on the edge of the beadwork where you are adding beads. Adding these three beads has the effect of adding a new column to the top of the row, thus increasing the number of columns. It is easy to remember that the stitch is an increasing stitch in this project when you add three beads at the end of the row instead of two. Note that the increased bead that you added counts as the first bead in the next row. Stitch the next row, adding an additional 5 beads (until there is a total of six beads on the row). After adding the 6th size 11 bead (A), you will make the decrease turn again by picking up a size 15 and size 11 bead (B, A) and then stitching through the last size 11 bead you added in the previous row. Making the increase stitch can be a little tricky. Make sure to hold the first bead in place just above the beadwork when you pull the stitch tight. This will keep the three beads from moving away from the body of the beadwork. Adjust the beads so the size 15 bead is aligned next to the second size 11 bead, side by side. The size 15 bead should be on the inside edge while the size 11 is lined up on the outside edge where you are adding beads. Continue peyote stitch adding six beads per row, working the decreases all on the same side and the increases on the same side until you have a total of seven sizes 15 beads along the bottom outer edge. To work the second side of the leaf, remove your needle from the working thread and add it to the other half of the bead thread. 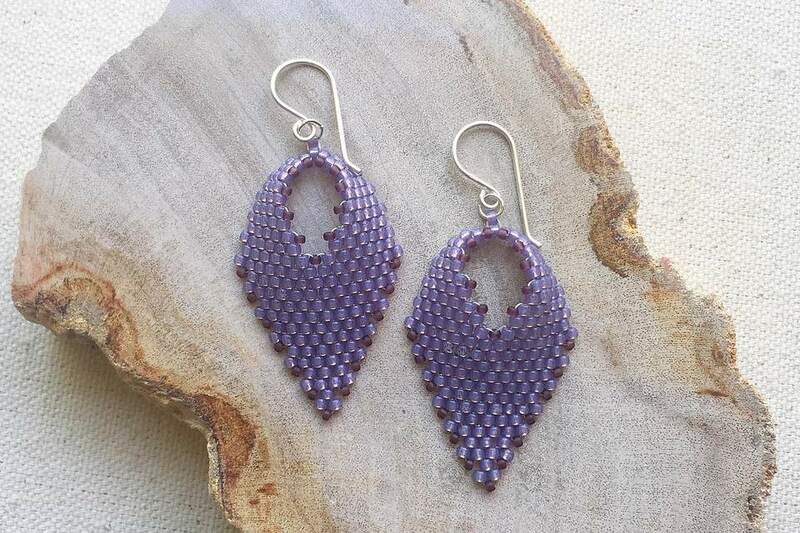 Pick up a size 11 (A) bead and continue making decreases and increases peyote stitches as described in Steps 3 through 6 until you have a total of seven sizes 15 beads along the bottom outer edge. The size 15 decorative beads should mirror the ones you added on the other side. To connect the two sides of the leaf, pick up one size 11 bead (A) and stitch through the beads on the opposite side of the leaf. It also looks nice if you use a larger bead to bridge the gap, such as a crystal bead. At this point, you may also want to consider how you will be using your Russian leaf. You may want to add a small beaded loop to hang the leaf before you weave in the ends and tie them off. Once you have finished weaving in the thread, add the needle back the first thread. Stitch through the bead you just added to bridge the two sides. Pull snugly. You can repeat the thread path by weaving back around to reinforce the stitch and make it stronger. When you are done, weave both ends into the beadwork following the peyote stitch pattern so the thread does not show. Knot the threads around a working thread or to each other to secure, and weave in a little more. Before cutting the threads, weave the thread so it is coming out the inside of the leaves (the back side). Cut it on this side to avoid threads showing on the front of your beadwork. Make three or four Russian leaves from size 15 beads to dangle from earrings. Make a 3-dimensional brooch using peyote stitched leaves and your favorite beaded flower. Dangle a tiny Swarovski crystal from the opening of the leaf and attach several leaves to a beaded rope for a sensational lariat.